The Canon IRC-2030 delivers great quality black and white as well as coloured prints. It is fairly fast at 30 ppm. The IRC2030 colour MFP printer model is also capable of scanning and copying, and can be upgraded with an optional fax machine. Print resolution can go as high as 1200 x 1200 dpi while scanning resolution is 600 x 600 dpi. The Canon IRC 2030 office colour printer could be better if it allowed Wi-Fi connectivity and slots for USB keys. It does, however, come with built-in Ethernet for workgroups. This compact printer comes with a bevy of internal and optional finishers. The Canon ImageRUNNER ADVANCE C2030 has a flatbed scanner on top and paper cassettes that can handle 2,000 sheets at a time at the bottom. The control panel features a 5.7 inch touchscreen display. The Canon ImageRUNNER IRC-2030 is capable of printing and copying continuously up to 999 pages. The IR ADVANCE C2030 printer is easy to use and install, thanks to its organised control panel and touch screen display. It has an Ethernet port and the Canon IRC-2030 printer is compatible with Macintosh and Windows computers. 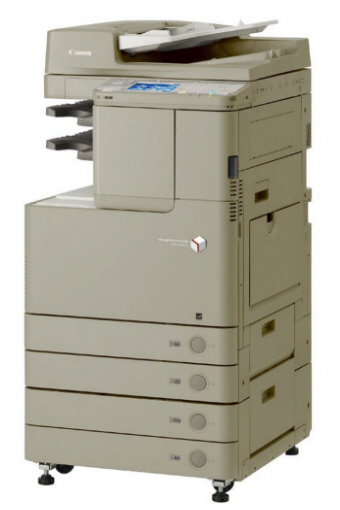 The Canon IR-C2030 colour laser printer also has resource saving features including an automatic document feeder and a duplexer. Users can expect good quality output from the Canon IRC-2030 colour copier due to the specially formulated Canon IR-C2030 laser toner cartridges. Unlike other multifunction printers and copiers, the Canon IRC2030 multifunction printer does not have standard faxing capabilities. Wi-Fi connectivity is also optional.